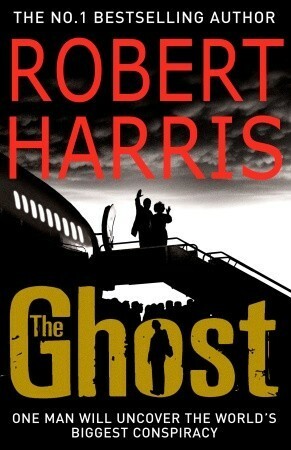 I’m currently reading The Ghost by Robert Harris, about a ghostwriter, not a tale of the supernatural. The moment I heard how McAra died I should have walked away. I can see that now. I should have said, ‘Rick, I’m sorry, this isn’t for me, I don’t like the sound of it,’ finished my drink and left. But he was such a good storyteller, Rick – I often thought he should have been the writer and I the literary agent – that once he’s started talking there was never any question I wouldn’t listen, and by the time he had finished, I was hooked. Britain’s former prime minister is holed up in a remote, ocean-front house in America, struggling to finish his memoirs, when his long-term assistant drowns. A professional ghostwriter is sent out to rescue the project – a man more used to working with fading rock stars and minor celebrities than ex-world leaders. The ghost soon discovers that his distinguished new client has secrets in his past that are returning to haunt him – secrets with the power to kill. Munich is about the 1938 Munich Conference and I found it absolutely fascinating as I know very little about the period beyond the basic facts – PM Neville Chamberlain was trying to maintain the peace in the face of Hitler’s aims to expand German territory (but I was a bit vague about the actual details) and in 1938 came back from the Munich conference with a piece of paper signed by Hitler, proclaiming that it meant ‘peace for our time‘. Munich is a mix of fact and fiction. 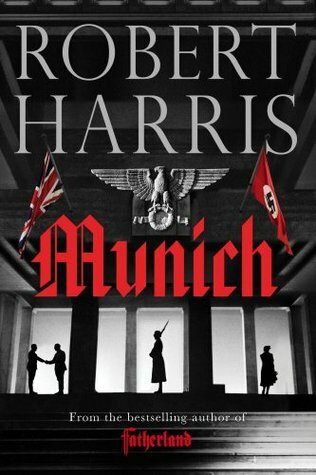 Harris uses two fictional characters, Hugh Legat as one of Chamberlain’s private secretaries and Paul Hartmann, a German diplomat and a member of the anti-Hitler resistance to tell his story. Harris’ interest in the Munich Agreement began thirty years ago when he made a BBC TV documentary, ‘God Bless You Mr Chamberlain’ to mark the fiftieth anniversary of the conference in 1988. He has thoroughly researched the subject, consulting many books (listed in the Acknowledgements) and has seamlessly woven the facts into the novel. It has a a strong sense of place, based no doubt on his visits to what was once the Führerbau, now the Faculty of Music and Theatre and Hitler’s old apartment in Prinzregentenplatz, now used as a police headquarters. Reading this book has made me want to know more about Neville Chamberlain and I hope to read one of the biographies that Harris lists. The fictional story of Hugh and Paul, who had been friends at university six years earlier adds additional tension and drama to the already tense story of the Munich conference. As in his earlier books Harris has captured the atmosphere and mood of the times, making me feel as though I’m there with the characters taking part in the action. The key characters are seen through Hugh’s and Paul’s perspectives – Chamberlain and Hitler – and others such as Mussolini, Goering and the other British politicians who travelled with Chamberlain to Munich. Among the later was Lord Dunglass, described by one of Chamberlain’s secretaries as ‘one of the cleverest politicians she had ever encountered‘; she considered that he would ‘be Prime Minister one day‘. At the time it was inconceivable that a premier could sit in the House of Lords and her prediction was dismissed. However, Dunglass went on to inherit his father’s title and become the 14th Earl of Home and as Sir Alec-Douglas-Home (renouncing his peerage) he did indeed become Prime Minister. I really like Harris’ straight forward writing style with no flashbacks, fly forwards or ambiguities. I learned a lot from this book and as far as I can tell (as I said I don’t know much about the period) it is an accurate version of what happened at Munich. It is a dramatic story well told – definitely a 5* book! Teaser Tuesdays is hosted by The Purple Booker. Post two sentences from somewhere in a book you’re reading. No spoilers, please! List the author and book title too. My first paragraph this week is from Munich by Robert Harris, which I’m currently reading. Shortly before one o’clock on the afternoon of Tuesday 27 September 1938, Mr Hugh Legat of His Majesty’s Diplomatic Service was shown to his table beside one of the floor-to-ceiling windows of the Ritz restaurant in London, ordered a half-bottle of 1921 Dom Perignon that he could not afford, folded his copy of The Times to page seventeen and began to read for the third time the speech that had been delivered the night before in Berlin’s Sportpalast by Adolf Hitler. Here is a teaser from page 99. As Chamberlain’s plane judders over the Channel and the Fürher’s train steams relentlessly south from Berlin, two young men travel with secrets of their own. Hugh Legat is one of Chamberlain’s private secretaries, Paul Hartmann a German diplomat and member of the anti-Hitler resistance. Great friends at Oxford before Hitler came to power, they haven’t seen one another since they were last in Munich six years earlier. Now their paths are destined to cross again as the future of Europe hangs in the balance. I’m now up to M, N, and O in my A – Z of TBRs, a series of posts in which I take a fresh look at some of my TBRs to inspire me to read more of them by the end of the year, or maybe to decide not to bother reading them after all. These TBRs are all physical books – I’ve not included e-books. Looking at my books like this is encouraging me to read more of my own books as I’ve read two of the books I’ve featured in the earlier posts. M – is for Mercy by Jodie Picoult, a book I’ve had since 2008. LibraryThing predicts that I probably won’t like this book. Two cousins are driven to extremes by the power of love, as one helps his terminally ill wife commit suicide and the other becomes involved in a passionate affair with his wife’s new assistant. I bought this book because I’ve read and enjoyed three other books by Jodie Picoult. According to the sworn voluntary statement of James MacDonald, his wife had been suffering from the advanced stages of cancer and had asked him to kill her. Which did not account for the raw scratches on his face, or the fact that he had traveled to a town he had never set foot in to commit the murder. Maggie had not videotaped her wishes, or even written them down and had them notarized to prove she was of sane mind – Jamie said that she hadn’t wanted it to be a production, but a simple gift. N – is for Notes from an Exhibition by Patrick Gale (on my TBR shelves since 2011). LibraryThing predicts that I probably will like this book. When troubled artist Rachel Kelly dies painting obsessively in her attic studio in Penzance, her saintly husband and adult children have more than the usual mess to clear up. She leaves behind an extraordinary and acclaimed body of work – but she also leaves a legacy of secrets and emotional damage that will take months to unravel. I haven’t read any of Patrick Gale’s books, but I was attracted to it by the blurb. O – is for An Officer and a Spy by Robert Harris a book I’ve only had for nearly two years. LibraryThing predicts that I probably will like this book. A recreation of a scandal that became the most famous miscarriage of justice in history, this is the story of the infamous Dreyfus affair told as a chillingly dark, hard-edged novel of conspiracy and espionage. Paris in 1895. Alfred Dreyfus, a young Jewish officer, has just been convicted of treason, sentenced to life imprisonment at Devil’s Island, and stripped of his rank in front of a baying crowd of twenty-thousand. I bought this on the strength of the other books by Robert Harris that I’ve enjoyed. I’ve heard of the Dreyfus affair but know very little about it. The Fear Index by Robert Harris is a fast-paced story set in the world of high finance and computer technology but it didn’t appeal to me as much as the other books by him that I’ve read. It’s about scientist Dr Alex Hoffman, who together with his partner Hugo Quarry, an investment banker, runs a hedge fund based in Geneva, that makes billions. Alex has developed a revolutionary form of artificial intelligence that tracks human emotions, enabling it to predict movements in the financial markets. It’s built around the standard measure of market volatility: the VIX or ‘Fear Index’. Alex wakes up one morning in the early hours to find an intruder has managed to bypass the elaborate security of the house. He challenges him only to receive a blow to his head that knocks him out and the intruder escapes. That is just the start of his troubles. A brain scan indicates he may have MS or possibly dementia and he is advised to take further advice, which of course, he doesn’t want to do. It appears that someone is out to destroy him and his company and even worse it soon looks as though this will cause a major global economic crisis. He is at a complete loss as to who it can be. It’s someone who has infiltrated into all areas of his life, affecting his marriage as well as his business. He even begins to doubt his sanity. On the one hand it helped me understand a bit more about hedge funds and how they operate but I got lost in the computer technology details. The characters are all not particularly likeable, but it’s definitely a page turner with plenty of suspense as the story raced to a conclusion, and it kept me puzzling over what or who was really causing the paranoia and violence. I thought it began well but didn’t find the ending very illuminating or satisfying and was left wondering what it was really all about. I liked the chapter headings with extracts from books such as Charles Darwin’s On the Origin of Species and The Descent of Man and Mary Shelley’s Frankenstein which made me wonder if the book was about the evolution of man into machine. Just an idea – if you’ve read the book what did you make of it all? 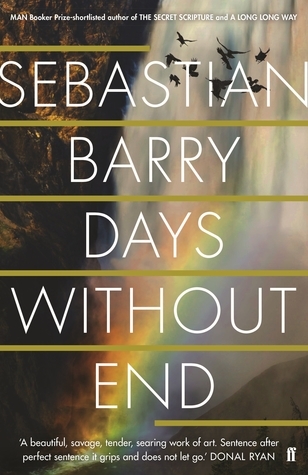 Now: I’m currently reading Days Without End by Sebastian Barry, a book I’ve borrowed from the library. It was awarded the Costa Book Award 2016 and won the 2017 Walter Scott Prize. It was also longlisted for the Man Booker Prize 2017. I’m enjoying this book, narrated by Thomas McNulty in his own style of speech, grammatically incorrect and in Irish and American slang – surprisingly easy to read. 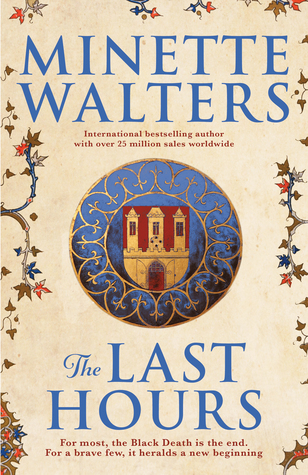 Then: I’ve recently finished reading The Last Hours by Minette Walters, which will be published on 2 November in hardback and as en e-book. My review will follow soon. 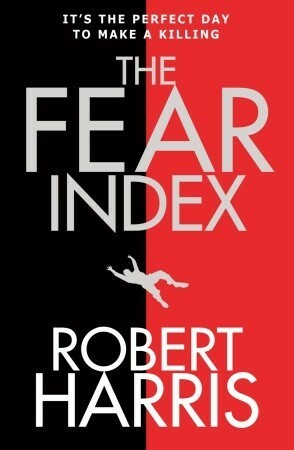 Next: I think I’ll read The Fear Index by Robert Harris. This is another book I’ve borrowed from the library and having dipped into it I’m itching to read it. His quest forces him to confront the deepest questions of what it is to be human. By the time night falls over Geneva, the financial markets will be in turmoil and Hoffmann’s world – and ours – transformed forever.